SOJU’s the nectar that the Korean youth subsist on. No cause for celebration is needed to knock back the light and neutral spirit – just gob-smacking good food that needs washing down. 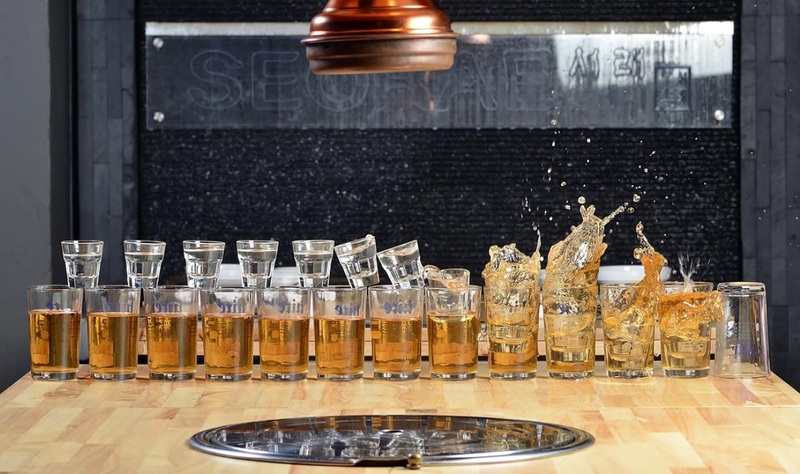 The soju culture’s caught on pretty well in Singapore, too. Here are the most solid options to hit up in 2019 – they field both the promise of intoxication and an evening of pocket-friendly and delish food. Hand the souls who thought of Korean-Mexican fusion a Nobel Prize. Turns out a common love for unbridled spice and zest can lead to some mouthwatering tag team action. More to our point, the folks at Don’t Tell Mama extend those crossovers to their drinks programme. Enter the sojurita. The name’s self-explanatory. The upended bottles and fruity concoctions are not only delightful to chug, but fare great in Instastory and Instagram posts. Don’t Tell Mama, 52 Tanjong Pagar Rd, Singapore 088473. That’s got to be healthy, right? Well, this isn’t technically a bar, but post-work drinks are very much intertwined with the Koreans’ love for hearty, gratifying food. Seorae stays true to that formula. Outside of the drinks, the BBQ grill restaurant is every meat lover’s haven. The usual soju options are on hand, but go straight for the star of the show: the Seorae Subak bomb. That’s right, soju’s dumped into this scooped-out watermelon. The flesh has been curled into crunchy balls that punctuate the boozier notes of the alcohol with refreshing bursts of flavour. Joo Bar’s the first name to come to mind when you’re in the mood for Korean drinks. And for good reason. Not only are the drinks unabashedly solid, you get the full Korean experience in the form of steaming hot, sauce-slathered dishes lifted right out of Korean bar culture. You’ll get the usual Chamisul by the bottle here to wash your fried chicken down. You’ll also find the sojurita here – and don’t miss out on the uncommon Yakult soju, either. While off-topic, we wouldn’t be being honest if we didn’t mention the legendary Joo Bar makgeollis that they actually brew in-house. Be sure to cop a sip of those. This hidden gem of a restaurant offers ridiculously low prices for bottles of soju all day every day – you can get Chamisul and othered flavoured soju here for a song at $11 per bottle – even after tax that’s almost a fifth cheaper than buying from most retail stores. Frequent 1-for-1 deals on the food menu (which includes the usual fried chicken and bar snacks) keep the night going and the booze flowing.